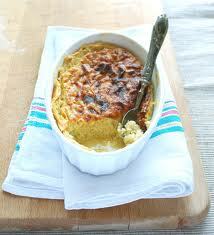 2 fennel,4 eggs,200 ml of cream,20 g of butter,30 g of flour,1 pinch of salt,1 dash of pepper,1 pinch of nutmeg. Private of the hardest parts of the fennel and beards, wash them and cut them into thin slices.Arrange in a basket for steaming.Bring to a boil in a saucepan 1 liter of water, lean over the basket.Cook the fennel 10 minutes: they become tender.Remove from heat and let cool.Shell the eggs in a bowl, whip with a whisk to make them swollen and homogeneous.Add the cream, flour, salt, pepper and nutmeg.Stir with a whisk to make smooth preparation.Add the fennel steamed, stir.You can use a food processor to simplify all the operations in which case you will get a creamy mixture.Turn the oven to 120 degrees. Butter a pudding mold and fill with the mixturepreparato.Infornatelo and cook 45 minutes: the flan must be consistent and take a light golden color.Check the area with a wooden toothpick, bake another 5 minutes if necessary.Baked flan, sformatelo on a serving platter. Serve.